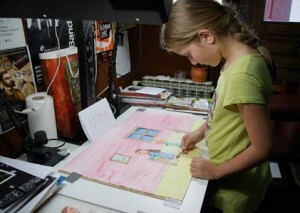 Filmmaker Jasminka Ljubic and students from SKOLA ANIMIRANOG FILMA (SAF) School of Animation in Cakovec, Croatia, will lead a hands-on workshop for students ages 12-18. SAF will be visiting the United States and is offering this special opportunity to students during their visit. Space for this workshop is very limited. Reservations are required. Email us for more information. Saturday, January 11, 10 a.m.-4 p.m.
$50, scholarships available. RESERVATIONS REQUIRED. Contact Youth in Arts to reserve a space. There will also be a 2-hour screening and demonstration of SAF’s work and software that is free and open to the public on Friday, January 10. Click here for the free Friday event information.